Writing is often described as a craft, and usually in counterposition to art. In the Romantic Era, art was seen as the precinct of special, sensitive people, who were inspired by a Muse. Craft, on the other hand, involved practice, tradition, and the perfection of skills. Today, professional writers are almost a single mind—writing is a craft, not an art. There are a few good reasons to ally with craft. Writing is hard work, and revision thankless. Yet, plenty of non-writers just imagine writers “being creative” and generating stories. Then the money flows on in. Writing skills can be learned, though mostly just by reading widely, and so it has a lot in common with other crafts. Practice makes…improvement. (Not perfect.) Then there’s the publishing aspect. Writers take assignments, write to certain themes or lengths, and many pride themselves on their ability to write anything. Consider Booklife for the Holidays! It’s now been a year since my writing strategy book Booklife came out, and it’s received lots of praise, leading to an interview on National NPR, among other opportunities like speaking at MIT and the Library of Congress. I’ve even had artists and musicians tell me they picked it up and found that the advice in it worked for them as well. I know there are more of you out there, so if you’ve enjoyed Booklife and/or reading new content on this website, it would be wonderful if you’d be willing to blog about it this week, recommending the book as a holiday gift. (Or tweet or facebook if that’s more your style. Or even re-post something you wrote when the book came out.) Monies from sales will be directly reflected in my next couple of royalty statements and help off-set the cost of a couple of important projects my wife Ann and I are taking on gratis. As importantly, I’m interested to know how Booklife was of use to you (or, even, where you wished it would’ve been of more help), and will write a follow-up post here and on Booklifenow that links your post. If you tweet or facebook post, consider echoing into the comments thread here. 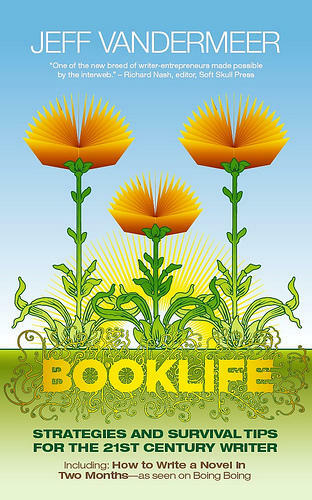 Finally, thanks for considering Booklife as a holiday gift for the creatives in your life! One bit of advice I think beginning writers sometimes need to hear is that it’s easy to fall into a pattern of trying to predict what an editor will like or not like, based not on the substance of a magazine or anthology’s guidelines but by wanting to read between the lines to gain an advantage. Guidelines are among the roughest and least precise of god’s creatures. They’re usually there simply to ward off the most inappropriate of submissions—for example, children’s stories about ponies to a magazine of dark horror or a novella to a market that only takes stories up to 4,000 words. The editor behind those guidelines is generally much more complex and nuanced, and, while maintaining a main focus for their publication or book project, may also be inclined to mix in some more esoteric material, or material that doesn’t hit the center of their brief. Further, it makes sense from a proactive point of view to send in even stories that you think for some reason may not appeal to an editor from a political or social point of view. You might be surprised, you might realize that you’ve pegged an editor incorrectly based on a very small sample of interviews or back issues. Editors’ tastes also change over time, and they react to new directions in whatever general area of fiction they’re involved with. So, as long as your story doesn’t violate a prime commandment of the guidelines, it’s generally not a good idea to otherwise presume to guess an editor’s tastes—or to try to parse subtext out of the way guidelines are written. Even back issues of a magazine may not fully illuminate for a writer the editor’s tastes because the editor may not have received a good example of a particular type of story and therefore hasn’t yet published that type or that particular approach. Editors, like all human beings, are complex organisms and should be treated as such.